This article is about the two-cylinder V engine. For the Soviet V-2 tank engine from World War II, see Kharkiv model V-2. For other uses, see V2 (disambiguation). A V-twin engine, also called a V2 engine, is a two-cylinder internal combustion engine where the cylinders are arranged in a V configuration. Although widely associated with motorcycles, V-twin engines are also produced for the power equipment industry and are often found in riding lawnmowers, small tractors and electric generators. In November 1902 the Princeps AutoCar Co (UK) advertised a V-twin engined motorcycle, and in 1903 V-Twins were produced by other companies, including the 90 degree XL-ALL (made by Eclipse Motor & Cycle Co in the UK). Also, in 1903, Glenn Curtiss in the United States, and NSU in Germany began building V-twin engines for use in their respective motorcycles. Peugeot, which had used Panhard-built Daimler V-twins in its first cars, made its own V-twin engines in the early 20th century. A Norton motorcycle powered by a Peugeot V-twin engine won the first Isle of Man Tourist Trophy twin-cylinder race in 1907. 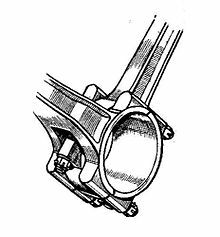 Most V-twin engines have a single crankpin, which is shared by both connecting rods. The connecting rods may sit side-by-side with offset cylinders, or they may be "fork & blade" items with cylinders in the same plane without an offset. Some notable exceptions include the Moto Guzzi 500cc (with 120° V angle and 180° crank pin offset) that Stanley Woods rode to win the 1935 Isle of Man TT; the 1983 Honda Shadow 750, claimed as being the first perfectly balanced narrow-angle V-twin by using an offset-dual-pin crankshaft; and the 1987 Suzuki VX 800, 45° V angle with 45° crank pin offset in USA and 75° crank pin offset for the rest of the world. Generally, a two-cylinder engine with the cylinders arranged at any angle greater than zero degrees and less than 180 degrees may be classified as a V-twin, although an angle that approaches zero is not practical. Despite Ducati referring to its 90 degree twin cylinder engine as an "L-twin"—with the front cylinder nearly horizontal and the rear cylinder almost vertical, there is no technical distinction between V-twin and L-twin engines. Assuming correct counterweighting, a 90 degree V-twin will achieve perfect primary balance. However, the 90 degree layout will produce an uneven firing interval, with the second cylinder firing 270 degrees of crankshaft rotation after the first cylinder, followed by 450 degrees of rotation before the first cylinder again fires. A V-twin with an angle of less than 90 degree cannot achieve perfect primary balance unless offset crankpins, a balance shaft, or both are employed to counteract reciprocating forces. However, the firing interval will not be as uneven as with the 90 degree layout. A Moto Guzzi Technical Services representative tried to explain to LA Times columnist Susan Carpenter that Moto Guzzi engines are "called 'transverse' because the engine is mounted with the crankshaft oriented front to back instead of left to right." In spite of this, it could be assumed that those who call V-twin motorcycle engines "transverse" when they are mounted with the crankshaft front-to-back and the cylinders sticking out the sides are saying that to them, the engine's axis is the line passing from one cylinder to the other, at a right angle to the crankshaft, rather than going by the crankshaft's axis. Highly technical sources, such as V. Cossleter's Motorcycle Dynamics, or Gaetaeno Cocco's Motorcycle Design and Technology are careful not simply to use the terms "longitudinal engine" or "transverse engine," but rather to specify that they mark the engine's orientation based on the crankshaft, and so they will say "transverse crankshaft engine" or "longitudinal crankshaft engine", or, conversely, "transversely mounted cylinders" in referenced to the classic BMW orientation, with a longitudinal crankshaft and cylinders at a right angle to the axis of the frame. The engine can be mounted in transverse crankshaft position as on Harley-Davidsons, Ducatis and many recent Japanese motorcycles. This layout produces a twin cylinder motorcycle engine that is little or no wider than a single. A narrower engine can be mounted lower in the frame with handling benefits. A disadvantage of this configuration for air-cooled engines is that the two cylinders receive different air-flows and cooling of the rear cylinder tends to be restricted. Cooling problems are somewhat mitigated by having all "four" sides of each cylinder exposed to air flow. This differs from a parallel-twin cylinder engine which has a distinct front, back, and sides, but the inside of each cylinder is not exposed to airflow as the cylinders are typically joined together with a cam chain running up through the block in-between the cylinders. Some transverse V-twins use a single carburettor in the middle of the V-angle to feed both cylinders. While this allows an economy of parts, it creates further cooling problems for the rear cylinder by placing its hot exhaust port and pipe at the back of the cylinder, where it may be exposed to less cooling airflow. This air-cooled Ducati Monster 620 has a transverse crankshaft 90° V-twin with one cylinder lying horizontally, and one vertically, so that the rearward, vertical cylinder's air flow is less obstructed by the one in front. The longitudinal crankshaft two-cylinder V as seen on Moto-Guzzis and some Hondas is less common. This orientation is suited to shaft drive, eliminating the need for a 90° bevel gear at the transmission end of the shaft. A longitudinal crankshaft engine fits neatly into a typical motorcycle frame, leaving ample room for the transmission, and cooling is facilitated by cylinder heads and exhausts protruding into the air stream. Longitudinal crankshaft mounting is associated with a torque reaction that tends to twist the motorcycle to one side on sharp acceleration or when opening the throttle in neutral and in the opposite direction on sharp deceleration. Many modern motorcycle manufacturers correct for this effect by rotating flywheels or alternators in the opposite direction to that of the crankshaft. BSA made a V-twin car starting in 1921, then introduced a three-wheeler in 1929. V-twin engines, adapted from motorcycles, were featured in Morgan three-wheelers made from 1911 to 1939. Morgan introduced a new Morgan 3-Wheeler in 2011. A number of Morgan-inspired models are produced today including the Triking Cyclecar, which uses a Moto-Guzzi V-twin; the Ace Cycle Car, which uses a V-twin Harley-Davidson engine; and the JZR which uses engines from the Honda CX series. Mazda made 356 cc and 571 cc V-twins beginning in 1960 for the Mazda R360. JAP water-cooled V-twin engine installed in front of the radiator of a 1934 Morgan Super Sports three-wheeled cyclecar. Air-cooled Mazda V-twin engine installed in the back of a Mazda R360 kei car. A Briggs & Stratton 90 degree, industrial V-twin engine, seen from the accessory end. Commercial equipment such as pressure washers, lawn and garden tractors, tillers, generators and water pumps use V-twin engines when the equipment is large enough to need more power, usually in excess of 16 horsepower, than can be provided by a single-cylinder engine. These V-twin engines have horizontal or vertical crankshafts, depending on application, usually have 90 degree cylinder angles, and are usually forced-air–cooled. These engines have also found use as prime movers in riding scale Diesel locomotive models, as well as the power source for homemade motorcycles and light aircraft. Manufacturers of commercial V-twin engines include Briggs & Stratton with its Vanguard, Professional and Intek V-twin series, Honda with its V-twin series engines, Kawasaki with its FD, FH, FS, and FX series, Subaru with its EH series, Tecumseh with its OV691EA and TVT691 engines, and Kohler. ^ Genta, Giancarlo (1997). Motor Vehicle Dynamics: Modeling and Simulation. Singapore: World Scientific. p. 26. ISBN 9810229119. Archived from the original on 2015-02-05. Retrieved 2013-01-15. ^ a b Posthumus, Cyril (1977) . "Fathers of Invention". The story of Veteran & Vintage Cars. John Wood, illustrator (Phoebus 1977 ed.). London: Hamlyn / Phoebus. pp. 12–13. ISBN 0-600-39155-8. But the engine, now fitted lower, in front of the rear axle, had progressed to become a narrow vee-twin with cylinders at 20°, and giving an estimated 1.6hp at 700 rpm. ^ a b Ling, Peter J. (1990). America and the Automobile: Technology, Reform and Social Change, 1893-1923. Manchester, UK: Manchester University Press. p. 97. ISBN 0-7190-3808-1. Archived from the original on 2013-12-31. Retrieved 2013-01-18. 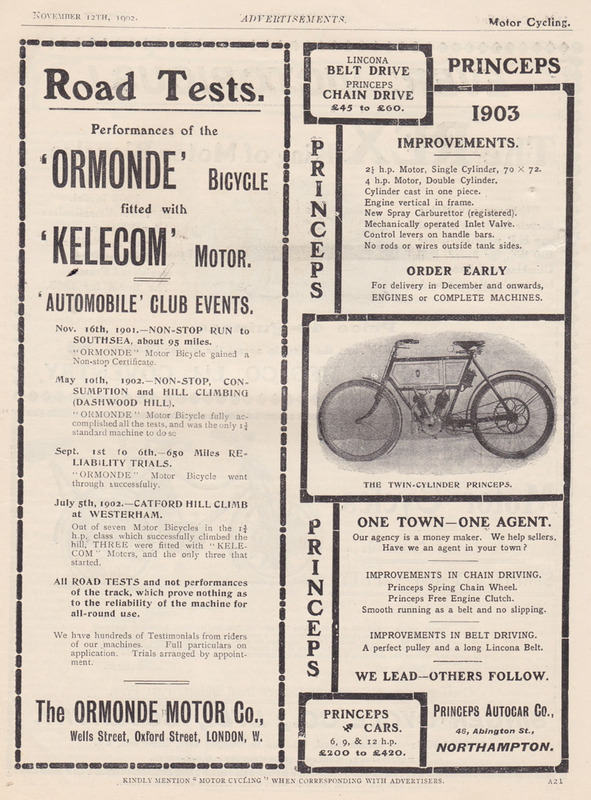 ^ "Motor Cycling, November 12th, 1902". oldbike.eu. Archived from the original on 5 April 2016. Retrieved 9 May 2018. ^ de Cet, Mirco, ed. (2002). The Illustrated Directory of Motorcycles. St. Paul, MN USA: Salamander Books. pp. 117, 340. ISBN 0-7603-1417-9. Retrieved 2013-01-18. ^ a b Walker, Mick (2000). Mick Walker's European Racing Motorcycles. Tyne & Wear, UK: Redline Books. p. 92. ISBN 0-9531311-3-0. Archived from the original on 2013-12-30. Retrieved 2013-01-18. ^ Garson, Paul (2005-03-20). "I Coulda Had a V-8.... so I Did". Motorcycle.com. Verticalscope. Archived from the original on 2008-08-21. Retrieved 2010-04-18. By 1934 Guzzi offered a range of 175, 250 and 500cc models including full touring machines. The next year they raised the ante once again, challenging the all-vanquishing Norton at the legendary Isle of Man TT, basically a course the British racer owned lock, stock and single barrel thanks to a phenomenal rider, Scotsman Jim Guthrie. Moto Guzzi went to a Brit for riding skills, one Stanley Woods. They gave him a new racer featuring a 120-degree V-twin with offset cranks firing at 180 degrees with bevel gears and shafts driving the SOHC, good enough for 44 hp at 7500 rpm and 112 mph, on equal standing with the Norton. It had an ace up its sleeve so to speak in that it incorporated a type of pivoted-fork rear suspension while the frontend was a springer, a design that had never won a Senior TT due to its handling deficiencies, or so was thought. Guzzi had done some tweaking in that department as well. It also came equipped with a massive twin-leading shoe front brake, a 4-speed gearbox, and alloy wheels, another innovation to cut down unsprung weight. When the dust had settled and the calculations determined, the wreath of victory went to Woods and Moto Guzzi, leaving Norton as they say, gobsmacked. Not only that, the Guzzi had smashed the track lap record. The next day Moto Guzzi was world famous. ^ "Honda: 1983 Shadow 750". Archived from the original on May 19, 2008. Retrieved 2008-05-20. ^ "Suzuki VX800". Cycle World: 36–37. July 1990. At some point in the motorcycle's development, the company changed the crankpin offset from 45 to 75 degrees in hope of creating a smoother-running motor. But just as production began, American Suzuki engineers decided that the new offset resulted is less mid-range power as well as a too-sanitized exhaust note, one that didn't sound very V-Twin-like. Presto, now the US models come with the 45-degree offset, while the rest of the world gets the 75-degree staggered crankpins. ^ a b Vittore Cossalter. "Shaking forces of twin engines". Archived from the original on 2011-07-24. Retrieved 2010-07-25. ^ "Indian Motorcycle". indianmotorcycle.com. Archived from the original on 29 March 2018. Retrieved 9 May 2018. ^ a b Cossalter, Vittore (2006). Motorcycle Dynamics (Second ed.). Lulu.com. pp. 291–294. ISBN 978-1-4303-0861-4. ^ Foale, Vittore. Motorcycle Handling and Chassis Design: the art and science (Second ed.). Tony Foale. pp. 11–6. ISBN 978-84-933286-3-4. ^ Carpenter, Susan (2007-07-25), "Chaps aren't de rigueur, but a helmet, yes", ASK THROTTLE JOCKEY, archived from the original on 2013-12-21, According to my source at Moto Guzzi Technical Services, "The Guzzi engine is a 90-degree 'L' twin, actually, because the cylinders are oriented at 90 degrees, instead of a typical V twin that has a smaller angle ( 60-degree, 77-degree, etc.). It is called 'transverse' because the engine is mounted with the crankshaft oriented front to back instead of left to right. Because of this you cannot run a chain or belt drive directly to the rear wheel like in most motorcycles. This is why you have a separate gearbox that bolts to the engine and transfers the power to the rear wheel via the drive shaft. This is how it is done on the Moto Guzzi and a BMW. Coombs, Matthew; Haynes, John; Shoemark, Pete (2002), Motorcycle Basics (2nd ed. ), Haynes, p. 1•31, ISBN 978-1-85960-515-8, The transversely mounted [cylinder] V-twin, as used to good effect for many years by Moto Guzzi, slots easily into the frame, and has excellent cooling as both heads are stuck out into the wind. It also provides the perfect set-up for using shaft drive. Holmstrom, Darwin (2001), The Complete Idiot's Guide to Motorcycles, Alpha Books, ISBN 978-0-02-864258-1, Ducati's engines, which are longitudinal (they are positioned lengthwise in the frame) most obviously display the "L" configuration, but Moto Guzzi's engines, which are transverse (arranged croswise in the frame), are also at 90 degrees. New 2009 Moto Guzzi V7 Classic Honors Historic Roots, Moto Guzzi Spa, archived from the original on May 27, 2009, retrieved 2009-04-29, Just as importantly, the V7 became an instant technology trendsetter thanks to its innovative transverse, air-cooled V-twin engine with shaft drive. Out of history, on to the road., Moto Guzzi Spa, archived from the original on March 26, 2009, retrieved 2009-04-29, We could, of course write a book about Moto Guzzi’s transverse V-Twin. ^ Heritage/History: Design/Technology (PDF), BMW Motorrad, archived from the original (PDF) on September 27, 2007, ...the boxer had three unique innovations that would remain throughout its years in development:The engine design included transversely mounted cylinders, which were cooled by exposure to the passing air. ^ Cocco, Gaetano (2004). "Chapter 11 The Engine". Motorcycle Design and Technology. St. Paul, MN USA: MotorBooks International. p. 117. ISBN 0-7603-1990-1. Archived from the original on 2015-02-05. Retrieved 2013-05-28. In some construction layouts the transverse width is the same as a single-cylinder engine, which allows very narrow frames and bodywork with small frontal areas. ^ Dean, Paul (May 2005). Edwards, David (ed.). "Service: Oil miser". Cycle World. Newport Beach, CA USA: Hachette Filipacchi Media. 44 (5): 160. ISSN 0011-4286. Archived from the original on 2014-04-15. Retrieved 2013-05-26. An air-cooled big-bore V-twin in particular can get very hot, especially the rear cylinder, which is not exposed to as much cooling air as the front. ^ Friedman, Art; Trevitt, Andrew; Cherney, Andrew; Elvidge, Jamie; Brasfield, Evans (April 2000). "Sport Cruisers Comparison - Seven Sport-Cruiser Motorcycles". Motorcycle Cruiser. Source Interlink Media. "Take a Spin" section, paragraph 4. Archived from the original on 2010-05-02. Retrieved 2010-09-10. Though the Valkyrie also has a longitudinal crankshaft, this torque reaction has been eliminated by making some of the components, such as the alternator, spin the opposite direction of the engine. ^ Battisson, Stephen (1997). "Developing the V6 - Taming The Beast". The Laverda V6. Stephen Battisson. p. 3. Archived from the original on 2011-07-08. Retrieved 2010-09-10. By arranging the rest of the engine internals to rotate in the opposite direction to the crankshaft their forces are cancelled out without having to resort to the weight, complexity and friction associated with two crankshafts. ^ Bobbitt, Malcolm (2004). Three Wheelers - Those were the days. Veloce Publishing Ltd. p. 16. ISBN 978-1-903706-81-7. ^ "Triking". 3wheelers.com. Archived from the original on 2010-10-05. Retrieved 2010-08-21. ^ "Ace Cycle Car". Archived from the original on 2008-12-10. Retrieved 2008-11-27. ^ "JZR Vehicles". 3wheelers.com. Archived from the original on 2010-10-05. Retrieved 2010-09-10. ^ Adolphus, David Traver. "Hemmings Motor News: 1964 Mazda R360". Hemmings Motor News. Archived from the original on 2012-07-11. Retrieved 2010-08-21. ^ "1962 Mazda R-360 Coupe "De Luxe"". The Bruce Weiner Microcar Museum. Archived from the original on 2010-09-24. Retrieved 2010-08-21. ^ "Briggs & Stratton Riding Mower Engines". Archived from the original on 2011-04-26. Retrieved 2011-04-21. ^ "Honda V-TWIN SERIES ENGINES". Archived from the original on 2011-07-22. Retrieved 2011-04-21. ^ "Kawasaki ENGINE SERIES". Archived from the original on 2011-04-23. Retrieved 2011-04-21. ^ "Subaru Robin". Archived from the original on 2010-11-29. Retrieved 2011-04-21. ^ "Tecumseh Power" (PDF). Archived (PDF) from the original on 2011-07-16. Retrieved 2011-04-21. ^ "Kohler Engines". Archived from the original on 2011-04-24. Retrieved 2011-04-21.